Home > E Number Basics > What are E Numbers? 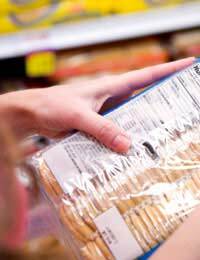 Glance at the ingredients list of pre-packaged and processed foods in a supermarket and the chances are you’ll spot an E number or two listed. But what exactly are these mysterious numbers and why are so many of them in the food and drink on sale today? They add colour and improve the look of foods or drinks. They add sweetness to foods and drinks. They help products gel together or become thicker, which helps improve the look and feel of foods. They act as flavour enhancers, to improve the taste of products. They’re used to give foods a much longer shelf-life than they’d normally have without it. As processed foods began to take off during the second half of the 20th century, and were kept on supermarket shelves for longer, the demand for more food additives became stronger. But whilst some additives are obtained from natural origins, many others come from artificial sources. It’s mostly these artificial additives that have caused controversy, with many people debating whether we really need them in our food. Synthesised additives can either be nature-identical or artificial. Nature-identical means that, although the additive is manmade, it has the same chemical composition as a natural substance. Where an additive is artificial, it has a different chemical structure from any naturally occurring substances. In order to keep track of this multitude of additives, the E numbering system was developed and became a legal requirement on packaging in the 1980s. The E in ‘E Number’ stands for European and it means these numbers have been tested for safety and been granted use in the European Union (EU). Some numbers that don’t have a designated E are sometimes allowed to be used in the UK, but may not necessarily have passed the tests are allowed to be used in all EU countries. Each E number is assigned its own unique number. This makes it a lot easier for manufacturers to list which additives are included in foods, as often the chemical names are long and hard to fit on labels, but it also makes it easier for consumers to identify which E numbers are included. It’s easier to remember and look up a three or four digit number than it is a great big unwieldy technical name. The list and quantity of E numbers used in our foods today has grown extensively. The numbering system helps keep track of what’s what by grouping E Numbers into various categories. For example colouring additives are mostly given numbers 100 – 181, the antioxidants form numbers 300 – 340, flavour enhancers make up numbers 600 – 650 and glazing agents are 900 – 910. As the list grows and more additives are added, other numbers may have to be used. Namaste! Please tell me which E numbers are acceptable for pure vegetarian point of view. Thank you. E-numbers are mostly dangerous chemicals used to 'dress up' food to make it last longer (stablisers), look more attactive (colourings), taste better (flavourings). Most of these E-numbers are not fit for human consumption. If you value your health and the health of your children then google any E-number and you will discover how lethal some of these additives are. We must also stop eating refined sugar and refined salt and switch to natural alternatives which are readilt available like demerera sugar and himalayan pink rock salt. Sugar is a legalised 'slow poison' and so is common salt. We must organic raw foods and we will get cancer, diabetes or any other major disease for that matter.